Our optometry practice offers a large selection of eyeglasses designer frames, sunglasses, reading glasses and contact lenses in Battle Creek & Portage, MI. 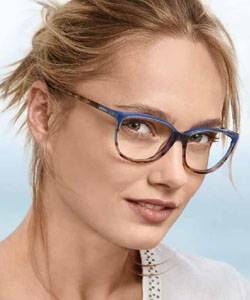 We carry the latest European and American designer eyewear collections in a variety of styles, colors and materials including titanium, stainless steel and plastic. New patients and all our current patients from Battle Creek, Portage, Marshall & Emmett Charter Township are welcome to visit us with their current prescription - no appointment necessary. Carl Zeiss Vision recently introduced Zeiss Officelens, a new, customized task-specific lens that allows patients to choose the amount of working distance they need. Zeiss Officelens is designed with intermediate vision in the top part of the lens, allowing a spacious view of a digital screen with comfortable posture. But unlike traditional computer-style lenses, Zeiss Officelens offers wearers a choice of three working distances to address differing workplace needs. Zeiss Officelens Book provides wide possible fields of near vision and intermediate to a range of about 3 ft. (100cm)—enough to see reading material and a computer monitor. Zeiss Officelens Desk extends the intermediate range to about 7 ft. (200cm), for seeing the immediate workspace. Zeiss Officelens Room provides intermediate to about 14 ft. (400cm), enough for comfortable vision in meetings and when moving around the office. Want to know more about our eyeglasses? Read our Eyeglass Basics! Read more here about our Special Promotions and Offers - just for you!